Pasadena Walks! is a grassroots advocacy group working to improve conditions for non-auto travel in Pasadena -- and everywhere else, of course. This is a shameless plug for stuff that we sell to raise funds -- all of which sports spiffy walking and cycling reminders. 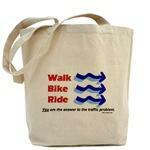 Our exclusive "Three Arrow" logo exhorts folks to "Walk, Bike, Ride / You are the answer to the traffic problem." Deliberately couched in terms of the "traffic problem" this stuff is intended to appeal to the self interest of an average driver and elected official, even as it unconsciously promotes greener thinking. Waive your coffee mug at your co-workers; flash your bag as you cross the street; stick a magnet on your office whiteboard. 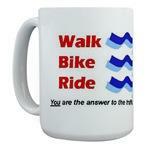 Get the message out, and help us change the auto-centric world one coffee mug at a time! Please Note: Pasadena Walks! is too poor to register as an official non-profit, so sorry no spiffy tax deduction if you like this stuff. But if you want to assure yourself that PW! is real, and makse real change, just google "Pasadena Walks!" in quotes, and see for yourself. 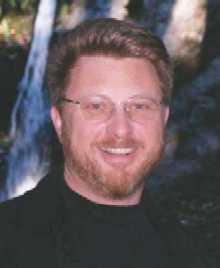 Thanx for visiting my site I'll check out the site u mentioned.